Discussion in 'Standard E-Cigarette Reviews' started by Tim Wiseman, Jan 13, 2019. Hi ECF members, In this review i take a look at the Stick V9 Max kit from Smoktech. The Stick V9 Max Kit was supplied for the purpose of this review by Smoktech. 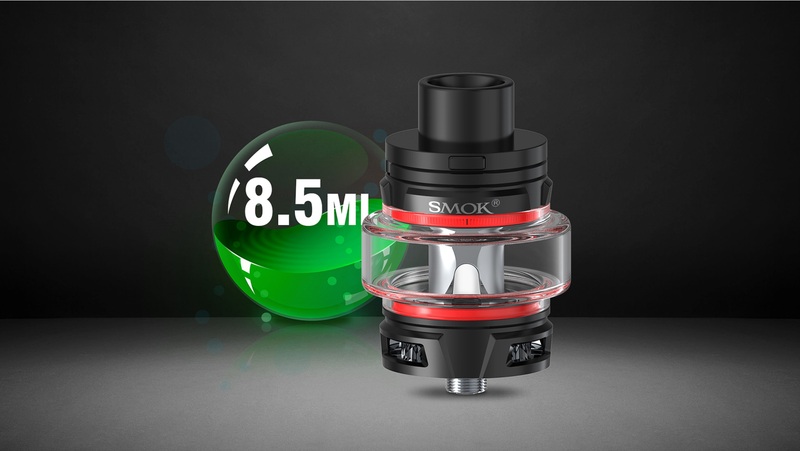 STICK V9 MAX - SMOK® Innovation keeps changing the vaping experience! The Stick V9 Max is the latest in Smoktech's Stick series of Vape pen devices. The V9 Max becomes their largest vape pen device with the battery having a 28mm diameter and the bulge glass of the tank a 35mm diameter. With an internal 4000mAh battery and whopping 8.5ml juice capacity the V9 Max is a beast. The battery has a max wattage of 60w and has both indications for battery life and protections. So let's give the Beast from the East a look! The Stick V9 Vape pen Kit comes in the usual Cardboard box with sleeve packaging that Smok products usual come in. On opening i was met by a tubular battery section that has more girth than any previous vape pen i have seen with a diameter of 28mm. The tank matches the chunky nature of this kit with a diameter around the base of 28mm before tapering out to meet a very bulged glass tube giving the Stick V9 Max Tank a diameter of 35mm at it's widest. 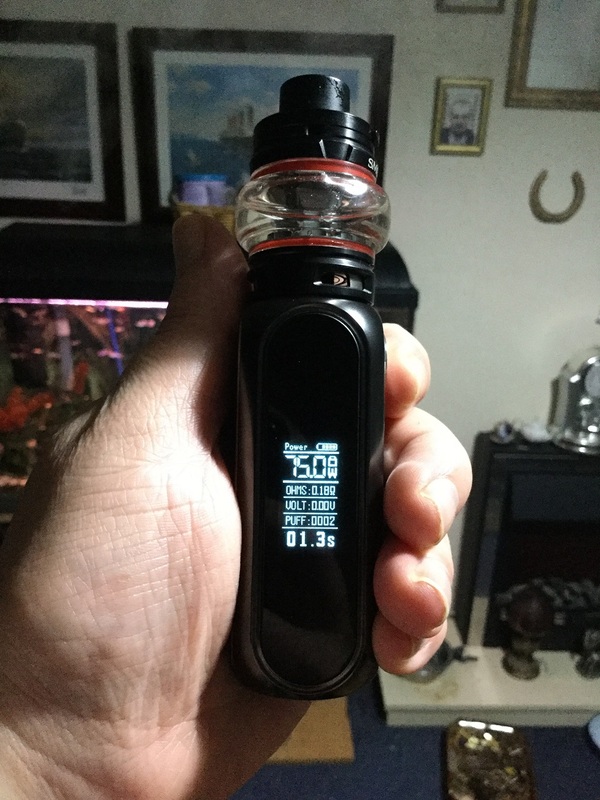 I received the Black version that has Red trim around the pentangular fire button and at the base, it's also available in Red, 7-Colour, Blue, Gold and Stainless Steel, all versions have matching tanks and Red trim on the battery and Red O-rings on the Max Tank. The front of the battery has the already described pentangular fire button with Red trim towards the top, this fire button has a small vertical LED strip housed on it. Further down in fancy font we have "Stick V9 Max" printed and the entire base section has a red trim before it tapers out at the bottom to a 30mm diameter. On the back of the battery positioned in a similar position to where the fire button is positioned on the front we have the micro USB port, further down "SMOK" is printed, on the bottom of the battery we have a central venting hole and printed safety stamps. 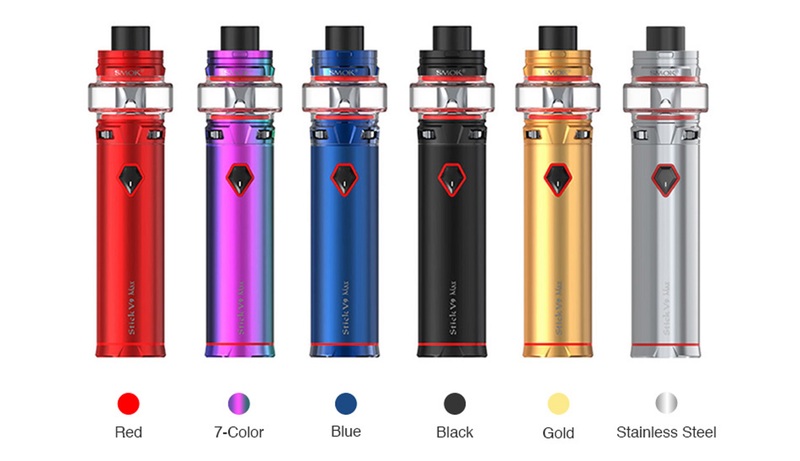 The tank has heavy textured design base and top which is based on the letter "V", the base as mentioned also tapers outwards to meet the glass section and has tri airflow slots. The glass section bulges out a long way making the kit remind me aesthetically of Seattle's Space Needle, also the large Red o-rings top and bottom are very visible. The top-cap smooths out and has a flat top surface with wide bore straight delrin drip tip. Despite it's massive size the Stick V9 Max is like all tubular devices very ergonomic. 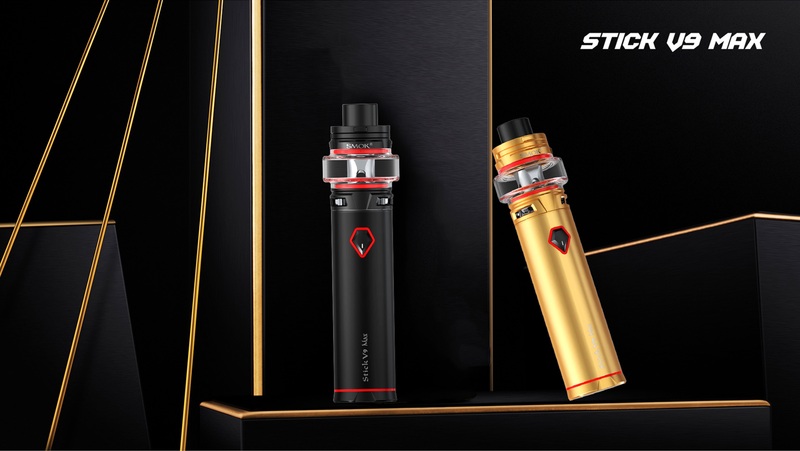 The Stick V9 Max tank is just a larger Baby V2 tank and uses the same V2 coils, it is large though, 28mm at the base and with a very bulged glass tube giving it a capacity of 8.5ml. It has the same cosmetic texturing as the Baby V2 and like the baby V2 it has a slide open on a hinge top-fill system with locking mechanism and sealing bung on the underneath of the top-cap. The fill port is large so no issues filling and like the Baby V2 it has tri wide airflow slots with stopper. The Max Tank does come with 2 new coils from the ever increasing Baby V2 coil family, the S1 and the S2. Pre-installed is the S1 which is a 0.15ohm single mesh coil which is rated between 40w and 80w with a best rating of between 60w and 70w. The other included coil is the S2 which again is 0.15ohm and is a quadruple coil rated between 30w and 70w with a best rating between 45w and 60w. All tank colours come with Red fitted o-rings but the spares match the colour of the tank, the Drip tip is a straight proprietary delrin wide bore that slips over a raised section so you can't use your own and their is no spare glass included which is a big con as the way the glass protrudes out it is more of a breaking candidate than usual. The Stick V9 Max is a simple direct output device that max out's with the 0.15 coils at 60w (i have no way of knowing if this is the case or not) so when the device is on simply press the fire button and vape. To turn the device on or off is the usual 5 clicks of the fire button and to indicate the power has been successfully turned on or off the LED indicator on the fire button will flash White 3 times. The battery has status indication which can be checked by clicking the fire button 2 times, this will cause the LED to light solid for 2 seconds. 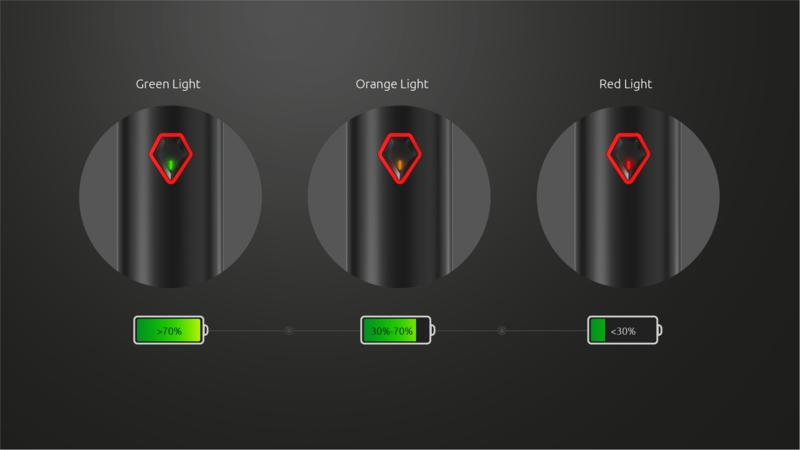 If it lights Green there is more than 70% of the battery life left, if it lights Orange the battery life is between 30% and 70%, if it lights Red the battery life is below 30% and when the voltage drops below 3.3v the light flashes 15 times and the device powers down so you need to charge. 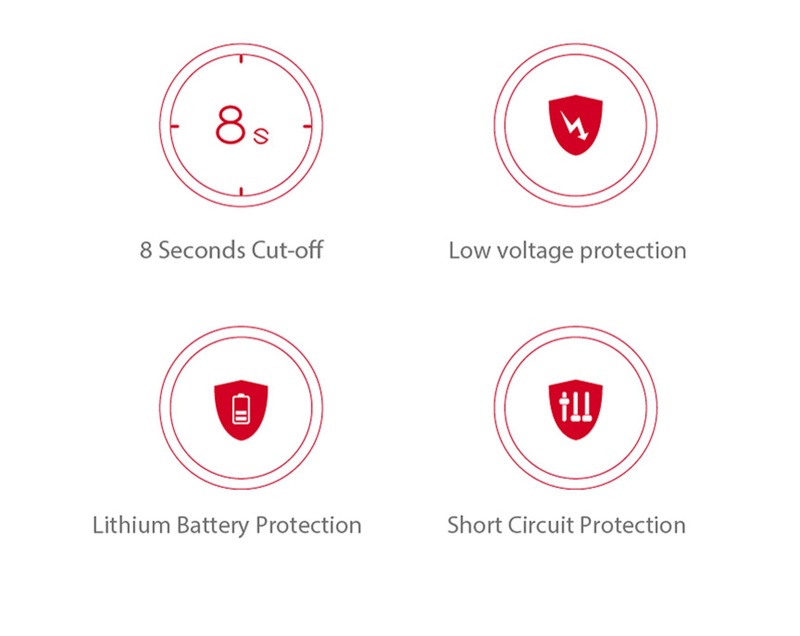 The Stick V9 Max also has safety protections which are indicated by various amounts of White flashes from the LED indicator followed by the device shutting down. 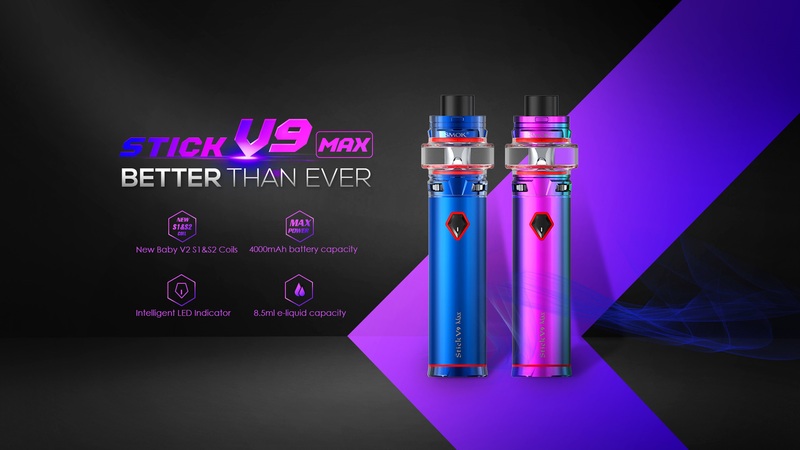 As well as the Stick V9 Max being a kit both battery and tank can be used independently, in fact the supplied coils especially the S1 perform better at a constant wattage over what the V9 Max battery gives you. As well as the tank being used on other devices the battery can also accommodate other tanks just be aware it's 28mm so some tanks will look weird on it and also it's a direct output device. The device fires instantly and the fire button is clicky and very responsive, it also feels very nice. I tried both coils and while the S1 Mesh coil did give very good flavour it was a cool vape and did suffer flavour wise as the battery got low. 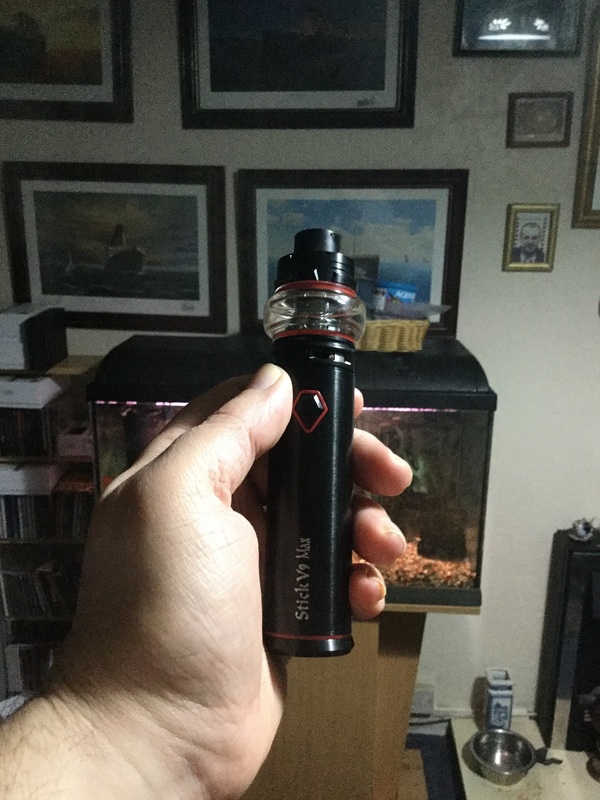 I tried the tank on a regulated device and found it best at 75W so it's not ideal for the kit but still a decent vape as long as you don't mind a vape on the cool side. I also found the tank quite loud and the airflow a bit turbulent mainly with the S1 coil, the airflow with the S2 was smoother and the tank while not silent was much quieter. The S2 coil suited the set-up much better giving a warmer vape and also good flavour, also the flavour didn't suffer from much loss in and still gave a warmish vape as the battery got low. The 4000mAh gave really good battery life and it does support pass-through which you might need as the battery took 5.5 hours to charge, the device would of benefited from protections to support quick charge. 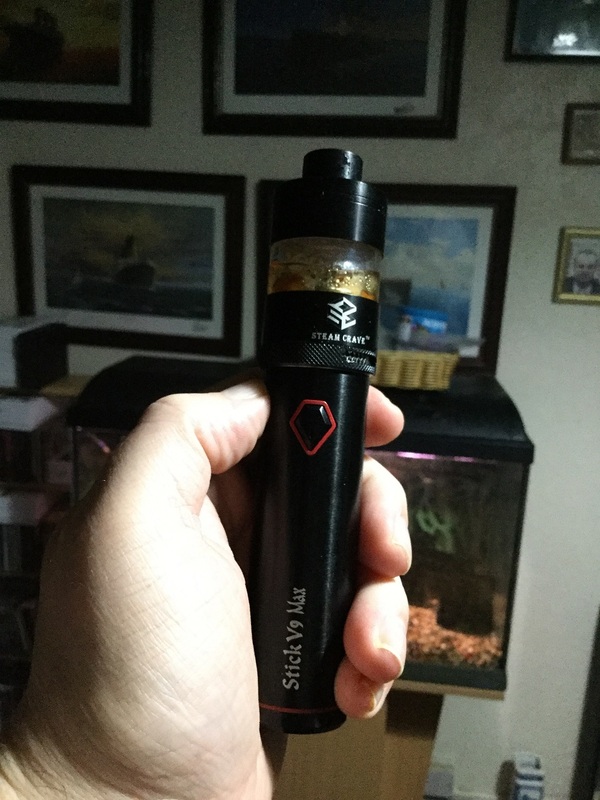 I would once again like to thank Smoktech for supplying the SMOK Stick V9 Max Kit for the purpose of this review.